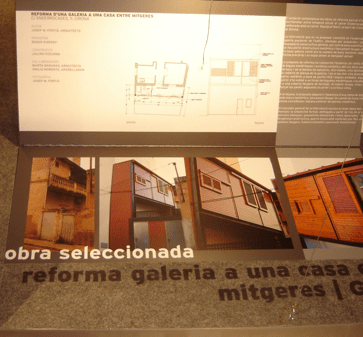 The project consisted in arranging the necessary work for the partial alteration of a multi-proprietary housing unit between dividing walls at the corner of Enderrocades street with Taquígraf Martí, in the neighbourhood of Vista Alegre in Girona. The house has several owners: the first and second floors are the property of Mrs Roser Gispert, who requested this renovation. The changes proposed consisted in demolishing the gallery at the back of the building, which was in a state of disrepair and replace it with a new closed metal arcade. 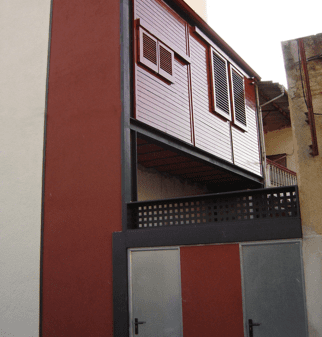 In this new covered balcony there is now a bathroom, which originally was there but had not been maintained, and consequently in very poor condition, and also an added space for the living room. Considering this, the renovation proposal required removing the previous ceiling structure, made out of metal beams and ceramic filler blocks, the old bathroom and the balustrade. The plate roof of the gallery was also dismantled. In its place, it was substituted with a metal arcade with steel profiles and welded beams. This arcade was welded to a new ceiling made of small beams and filler blocks; and to a concrete structure. The adjacent walls to the street and the neighbour property were reinforced. 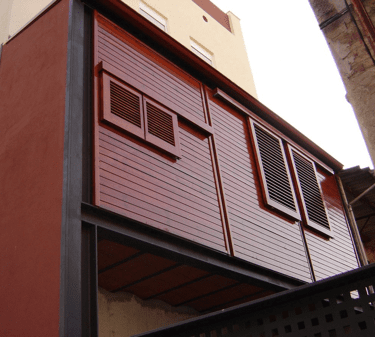 With respect to the facade, the proposal gives it the impression of a traditional Catalan merchant market, but with metal frames, wooden shutters and sliding windows, and an exterior metal railing. The general concept of the renovation is composed by two main ideas: the formal simplicity, obtained by using basic proportions, simple geometries and refined design; together with constructive lightness, achieved with the use of lightweight materials (light ceiling fixtures, aluminium window frames, floorboards pavement).